I've not used this word on my list yet, but I will. It even sounds dark doesn't it? Even a little mysterious! It needs to come out of archaic-land, and join the land of now! It does, Jingles - help me bring caliginosity into the light. I love it! Now why don't people talk like that anymore, Sally? The world would be so much more chilonic. Right, Jingles? I have never been to Oxford--but it sounds wonderful. This word totally describes where I live. (sigh) OREGON--land of rain, fog, a bit of snow--and the mysterious illusive sun. If you ever visit the UK, Beth, give it a squizz. I hate to say it, but I can never hear "Oregan" without thinking of the film Short Circuit. I kind of fancied the woman in it when I was young, and I remember her showing the robot where she lived on a map: "Oregan ... Or ... ree ... gan." My origins in Colorado (boasting 300 days of sun a year) were remarkably un-caliginous. I therefore grew up believing that foggy weather was the most romantic and mysterious of all possible settings. When I moved to Oregon and the land of mist and rain, I was absolutely overjoyed. Now in Dublin, foggy mornings are my absolute favorite. Living the caliginous life, befogged and (ideally) cobblestoned. They go together so nicely, don't they? Yes! Caliginated cobblestones ... from Dublin to Oxford to Oregan ... they're wonderful anywhere. I loved your description. 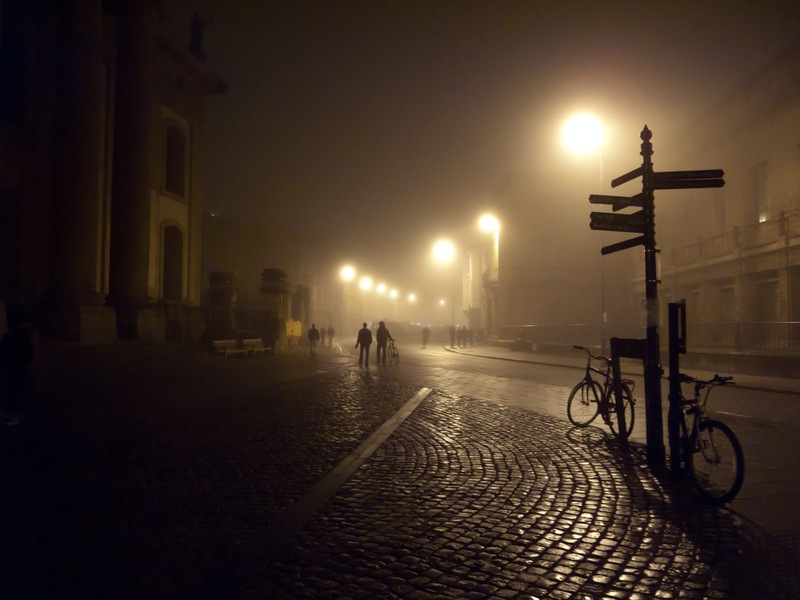 It reminded me of my hometown which is famous for its foggy days and night. (There's a huge lake). Beautiful pictures, Evi - most caliginous indeed. I especially like the first; hazy lights bursting through fog are so beautiful. Thank you.